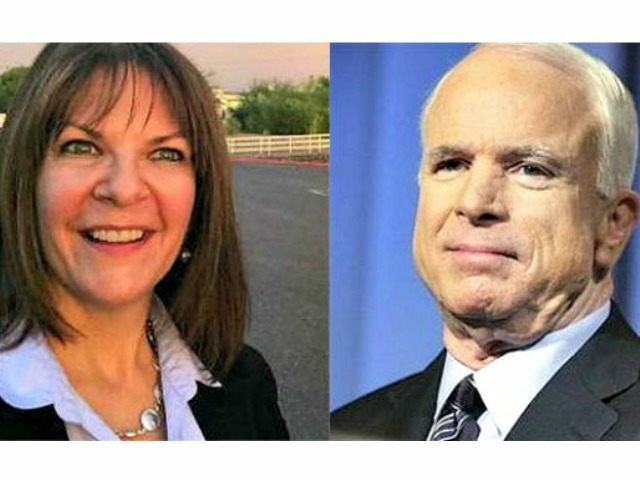 Conservative Campaign Committee PAC came out swinging against entrenched Sen. John McCain (R-AZ) and his bid for re-election against conservative Arizona State Senator Kelli Ward (R-Lake Havasu City) in a Saturday email urging PAC supporters to back Ward. The practicing emergency room physician recently returned from a trip to Washington, D.C. during which she met with conservatives pressing for their support. McCain’s actions calling conservatives “whacko birds” and “crazies” was called out among the PAC’s grievances against the over three-decade D.C. insider. In January 2014 McCain’s own party in Arizona censured the Senator for excessive liberal voting including support for the “Gang of Eight” amnesty plan. At the time of the Arizona State Committeemen meeting censure of the Senator, six of the state’s fifteen county parties had censured McCain. Maricopa County’s Republican Party Committee was among those and cited a “long and terrible record of drafting, co-sponsoring and voting for legislation best associated with liberal Democrats, such as Amnesty, funding for ObamaCare, the debt ceiling, liberal nominees, [and] assaults on the Constitution and 2nd amendment,” as an explanation for their decision. Saturday’s email noted the support for the “Gang of Eight” bill at the top of a list of “disappointing” McCain Senate votes. Second on the list of points against McCain was the censure. Third on the list of grievances was Gun Owners of America calling McCain “a liberal in disguise.” Also on the list of McCain votes disappointing to the PAC were funding for Obamacare, support of ObamaTrade, the Wall Street Bailout, supporting the “$600 Million fiscal cliff tax increase,” and raising the national debt 15 times. As the CCC PAC email suggests, Ward has seen significant and growing support. In the first quarter of fundraising Ward’s campaign raised over half a million, an achievement that at least in recent history has only been outdone by Sen. Ted Cruz.